Paloma and I getting ready for the New Year’s cleanse orientation at Goldensol yoga studio, Los Feliz. 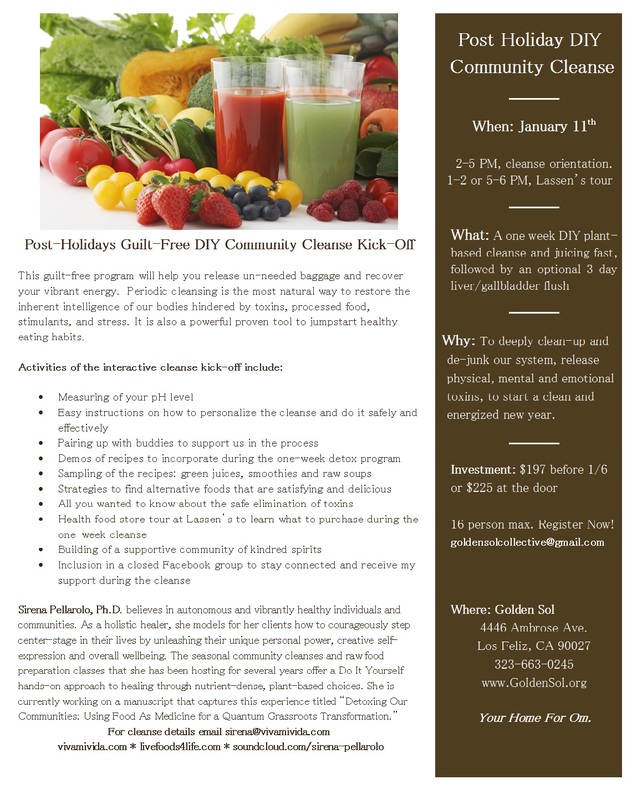 Yesterday I offered a one week cleanse orientation at Goldensol, a new yoga studio in Los Feliz. As my daughter Paloma and I were unloading the car in the parking lot, we were welcomed by a mysterious sign that said YES EQUALS YES. Interesting! I kept thinking about this affirmation as I prepared the table with the food and the equipment I would use to prepare the green veggie juices and smoothie recipes I would demo during the workshop. YES EQUALS YES. What a way to affirm a desire! During the class, this affirmation kept dancing in my consciousness as I witnessed the ganas, the excitement of the participants, who were looking for natural ways to reverse some health conditions as I shared how easy it is to use food as medicine in a simple and effective way. Their enthusiasm pushed me forward and I knew they were doubly affirming their celebration of life as they discovered effective tools to improve their health in the delicious drinks. YES EQUALS YES when we are ready to make a major shift in our lives, step into our power and arrive at decisions out of the wisdom of our hearts. YES MEANS YES when we let go of negativity to dive full-on into what we know is going to be supportive of our growth and unfoldment. YES EQUALS YES when we take that leap of faith and embark in enterprises that seem scary and hard at the beginning. YES MEANS YES when we affirm life over fear, insecurities, hesitations, no matter what the challenges are, no matter what others say, no matter if it’s going to work or not. What are YOU saying YES to today? To receive information on my upcoming programs please sign up here. This entry was posted in cleanses, food as medicine, green juices and smoothies, healthy living, Los Angeles, personal growth, plant based diet, raw food on January 13, 2014 by Sirena. What: A four session intensive group coaching program series to learn how to deal with weight gain, cravings, food allergies, digestive issues and low energy. Why: To receive personalized professional attention, support, guidance and acommunity of peers during the process. Where: From the convenience of your home, call in and join the interactive teleconference. Identify and by-pass emotional areas that trigger emotional eating. Bonus: preliminary individual health phone consultation, a closed Facebook group for daily check-ins, recordings of the sessions, hand-outs, individual recommendations, support from a buddy system. This entry was posted in cleanses, food as medicine, green juices and smoothies, group coaching, healthy living, holistic health coaching, Los Angeles, personal growth, physical exercise, plant based diet, weight loss, women and aging on December 29, 2013 by Sirena. This entry was posted in cleanses, food as medicine, green juices and smoothies, healthy living, Los Angeles, personal growth, plant based diet, raw food, weight loss on December 6, 2013 by Sirena. 1. What do you enjoy most about your career in the veg community? I enjoy the fact that it’s growing so fast. More and more people are getting into a plant-based diet and becoming much more aware of the issues related to the eating of animal products. In my own area of raw food, I see people experimenting with green juices and smoothies daily, and seeing the incredibly positive effects that these have in their health. I feel there is a change in consciousness in many areas, and food is one of them. People realize that to change the world, we need to change individually—as members of a larger community—and one of the ways is by paying attention to how we fuel our bodies, that is in accordance with a sustainable way of preserving our planet. Moreover, as a food justice activist, I believe in autonomous and vibrantly healthy individuals and communities, and that our bodies are the ultimate site of self-determination. So, in order to become really autonomous, the first thing we need to do is decolonize our bodies from commercial, processed food and other substances that keep us lethargic and lacking in energy. 2. What is one thing you wish someone had told you before becoming a vegan/vegetarian? Fortunately, I started exploring a raw food diet and cleansing in January 2002, when I participated in a program called The 21 Day Detox, led in Los Angeles by two amazing individuals, both naturopaths, Richard D’Andrea, M.D., and John Woods. I learnt so much from them, that I think they prepared me very well to go on my own journey safely. That’s why I have taken it to heart to teach other people how to develop personalized cleanses that are effective and safe. I felt the duty to share my experience with the Chicano/a Latino/a communities with whom I interact daily, as there is a lot of chronic disease and obesity in these communities due to a less than optimal diet resulting from the lack of good fresh produce in the “food deserts” where many of these people reside. 3. What caused you to want to become veg friendly? I was raised in Buenos Aires, Argentina, where the ingestion of meat is overwhelming. When I arrived in this country in 1988 to pursue a doctoral program, luckily, I started eating much less meat because I felt it didn’t taste as good as back home. I also come from a history of emotional eating, so the idea of exploring a raw food diet and periodic detoxing was very appealing to me. It happened right at a time in my life when my spiritual practices were becoming much deeper, and it was natural for me to change my diet to support that process. 4. Tell us more about your business? How can we get connected? After years of hosting seasonal community cleanses and raw food preparation classes, I decided to retire from my position as a college professor and work full-time in the area of health. I became certified as a holistic health coach and have been growing my practice since late 2011. I am using everything I learnt in my own journey to support post-menopausal women to recover their power over their bodies, and debunk disempowering beliefs about aging. As a holistic healer, I model for my clients how to courageously step center-stage in their lives by unleashing their unique personal power, creative self-expression and overall wellbeing. I offer bilingual programs that inspire individuals to reconnect with their bodies, minds and spirits by going back to the basics of a healthy lifestyle: a personalized nutrient-rich diet, energizing physical movement and a meaningful spiritual practice. I specialize in weight management for women in their prime through life-changing programs that include DIY detoxifications, live foods and powerful transformational techniques. I also offer wellness seminars in English and Spanish. I have a blog that focuses on live foods and detoxifications, http://livefoods4life.com/, and my holistic healing website is www.vivamivida.com. 5. What other activities are you involved with in San Diego? Every six months I spend a week doing a deep detox at the Optimum Health Institute in Lemon Grove, an amazing institution that firmly believes in the power of food as medicine. They follow Anne Wigmore’s principles of using the healing power of live food (sprouting, fermenting, juicing, lots of wheatgrass) to restore health. Every Friday morning, guests have the opportunity to share to the community their testimonials about healing with the power of plants. I have seen time and again hundreds of cases of individuals with “incurable diseases”–as defined by the traditional medical industrial complex–, make a 100% recovery and regain their health and vitality by sticking to this type of diet. Everything that I’ve learnt at OHI I share with the participants of my workshops and cleanses. I am looking forward to continue to collaborate with the San Diego Veg community in spreading this information to the public. 6. What tips do you have for those wanting to stay on a veg-friendly path? I would invite individuals to consider practicing a plant-based diet. I have seen many vegetarians and vegans who eat a lot of processed food, fake meats, etc. I think that the power of being on a veg-friendly path is to get acquainted with the amazing power of plants. That’s the natural fuel that our bodies need. And, if some “slips” happen, to just recommit and continue on the path. There are so many different varieties, flavors, textures, ways of preparing plants, that there is no way that we would feel deprived (not even in the intake of protein!). Also, I would suggest that individuals explore and pay close attention to their ancestral diet. According to the principle of “bio-individuality,” the great diversity of body types demand different types of diets. Usually, whatever our ancestors ate, our bodies do well with. We can always modify those traditional dishes with choices that are more congruent with the diet that we choose now. 7. What are your favorite veg dishes? I like very simple flavors, and I eat mostly what I prepare at home. I love greens, and I prepare them in juices and smoothies, salads and wraps. I always tell the participants of my food preparation workshops that I am not that interested in gourmet raw food, that my diet mostly responds to the requirements of a “colon boot camp.” I’m interested mainly in food that makes me feel vibrant and healthy and that keeps my body clean. That’s why I am very much into fermentation and sprouting. I always sprout my beans, grains and nuts, and if I happen to prepare a cooked quinoa dish (my favorite grain/seed), I will sprout it for a couple of days first, so that the life force and enzymatic power gets unleashed and becomes more digestible and nutritious. 8. What advice do you have for those that are interested or curious about being a vegetarian/vegan? I usually suggest to my clients to start slowly, adding veggies and fruits into their diet. The best way to do that is with green juices and smoothies. I have seen time and again that as people start to add these delicious and nutrient rich drinks into their diet, their taste buds get used to the natural flavors, they start to crave veggies and fruits due to the fact that they feel much better eating clean, and slowly, their diet starts transforming completely. This is a wonderful way to jump start a journey towards a plant-based diet. Enjoy the process, and don’t become too dogmatic, just find pleasure in your new choices! To receive information on my upcoming programs, please sign here. This entry was posted in cleanses, fermented waters and veggies, food as medicine, food justice, green juices and smoothies, healthy living, holistic health coaching, personal growth, plant based diet, raw food, sprouting, weight loss, women and aging on November 12, 2013 by Sirena. It’s been HOT! The end of the summer in Los Angeles usually tends to gift us with the high temperatures we missed earlier in the season. I hear people can’t sleep, are irritable, and can’t even do mental work in this heat. This extreme weather takes a toll on our bodies, and we need to be aware of that. The most important thing is to stay cool and hydrated. I have already talked about the importance of keeping our bodies hydrated in a recent post “Our bodies’ many cries for water.” . In it I mentioned how F. Batmanghelidj, M.D. considers that water is the cure to many of our ailments caused by modern life, as most of us are chronically dehydrated. Personally, when it’s so hot I scale down my Bikram Yoga practice and swim every day. There is something very cooling and refreshing about soaking in water and splashing in that fluid, all-embracing motherly element. But even then, it’s important to rehydrate after swimming, as the chemicals used to keep the water clean, the sun and the sweating (yes, we sweat when we swim! ), dehydrate us. I replenish the lost electrolytes with coconut water. It’s also good to add electrolytes to our drinking water, if we exercise and sweat a lot. In addition to drinking lots of filtered water, raw fruits and veggies are very hydrating foods. During this warm weather we usually feel less hungry, so go ahead and substitute some meals with delicious veggie juices and smoothies. You can find some easy recipes here and here. If your diet is composed mainly of processed and mostly cooked foods, you will need more water to hydrate. Also keep in mind that coffee, teas, alcohol, sugary sodas, cigarettes and other irritants are dehydrating and you’ll need to drink more water to counter their effect. These simple tips will help you stay healthy and at your best even during this torrid season. So, enjoy the end of the summer and stay cool! If you’d like to receive information on my upcoming programs, please sign up here. This entry was posted in food as medicine, green juices and smoothies, healthy living, Los Angeles, plant based diet, water as medicine on September 2, 2013 by Sirena. I know that this question might elicit different responses at this moment. Today we could feel “inflamed” due to another example of how the justice system in this country has shown one more time that we are really not all equal under the law. And I would say that is a very justified way of feeling, and at some point, I promise I’ll write a post about this. But what I really mean when I ask this question is if you have stopped to think whether your body has created an inflamed environment that is prone to disease, which eventually could become chronic. Some of my clients complain about digestive issues, for example, and this condition is a result of inflammation. …inflammation is a survival mechanism of great complexity. [It] occurs when a set of chemicals in the blood are activated by something foreign or broken. These chemicals attract defense cells that protect tissues against whatever is injuring them, from a thorn to a disease-causing microbe. The repair system is also activated by calling in different cells to fix the damage. Normally, inflammation is self-regulated, which means that as soon as it is triggered, it will start reactions that will stop further inflammation. However, if the body is constantly exposed to irritants, the inflammation response is switched on all the time—not just at small specific sites, but systemically all over the body and throughout the blood. This is what happens when exposure to toxins is high: modern humans are chronically inflamed. Inflammation (from the Latin word inflatio, “to set on fire”) becomes to the body’s environment what wildfires are to the planet’s” (92). If we reduce the intake of these foods, and add anti-inflammatory nutrients to our diet, like Omega 3 fatty acids (hemp, flax and chia seeds, walnuts, algae, fish and krill oil), curcumin (turmeric), plants that contain polyphenols, like all types of berries, raw plants that cool down our system and dark leafy greens that support liver detoxification (my favorite are dandelions), we limit our stressors and we cleanse our system regularly, we will keep inflammation in check. Dr Junger asserts that the root of inflammation is the “the toxicity of modern life, and our bodies’ weakness in dealing with it. Only when we start a treatment there, targeting the seed of the problem, can we truly begin to ward off disease” (11). This is why I am so insistent on periodic detoxifications of our bodies. It’s not that I’m a broken record, it’s that periodic cleanses are the most effective and empowering practices to keep our bodies clean and healthy. If reading this post has convinced you that it’s time for a tune-up, please check my upcoming DIY Mid-Summer Community Cleanse and Raw Food Preparation Class starting July 27. Your body and the planet will thank you for it. This entry was posted in cleanses, food as medicine, green juices and smoothies, healthy living, Los Angeles, plant based diet, raw food, sugar-free on July 16, 2013 by Sirena. I am launching an eight session intensive phone group coaching program in weight loss. From the convenience of your home, I will be coaching you on how to release the weight issues forever. As I know that many times we need someone to hold us accountable to make permanent changes to support our health, I designed this easy-to-follow program. I hope you join me. And, if you know of someone who might benefit from a program like this one (who wouldn’t? ), please forward the information to them. For more info and to register, go here. Group coaching programs are very beneficial, as the next seven reasons will show. Group coaching gives you the opportunity to share your feelings with others and develop deeper connections, making your sessions more meaningful. Knowing you are not alone in your journey will help you develop the confidence to address your challenges and the motivation to succeed. When individuals are part of a group, they procrastinate less, accomplish more, and reach their goals faster. You’ll brainstorm solutions, open creativity channels, and uncover opportunities you may not have discovered working alone. When you work in a group, you’re exposed to a variety of insights that offer you multiple angles and motivate you to develop new solutions. Get the same quality coaching, but at a fraction of what individual coaching costs. Group coaching is a smart and affordable way to receive top-notch guidance. When you work in a group, the whole team supports you and celebrates your success. Working with a group is a social event that participants look forward to. You will join a close-knit group that is energizing, motivating and most of all – fun! Group members often become lifelong friends. Please sign up to receive information on my upcoming programs here. This entry was posted in cleanses, food as medicine, gluten-free, green juices and smoothies, group coaching, healthy living, holistic health coaching, Los Angeles, personal growth, plant based diet, raw food on April 29, 2013 by Sirena. Did you know that if you add a detoxing veggie juice or smoothie into your daily diet, miraculous things will start to happen? You will begin to detox naturally and your body will start craving healthy, nutritious food, instead of the one that does not support your health. I have received many testimonials of clients who reduced their blood sugar and lost incredible amounts of pounds by just incorporating this healthy practice into their lives! Juicing and blending are the best way to incorporate raw foods easily and simply into your diet. When you start incorporating these raw foods, you will start to “crowd out” processed, denatured foods that have no nutrients but lots of calories. When you think juicing or blending, think green. The rest adds flavor and other nutrients, of course. The power of the juice is the greens: lots of chlorophyl and oxygen that will alkalize your body and keep degenarative disease away. Put just enough sweet fruits, like Granny Smith apples or carrots, so it’s not so bitter. If you have a chronic disease, like diabetes, cancer, heart disease or candida, avoid the sugar. To our health. 2 pieces of cactus, the more, the better! This entry was posted in cleanses, green juices and smoothies, healthy living, Los Angeles, raw food on February 18, 2013 by Sirena.